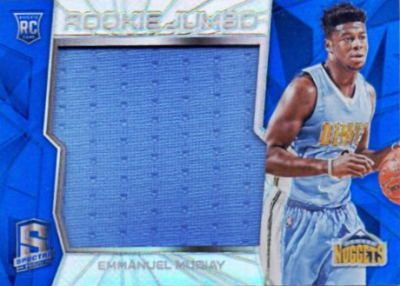 2015-16 Panini Spectra Basketball is back on the court with the same bold designs and colors from previous years. Every hobby box includes seven total hits. 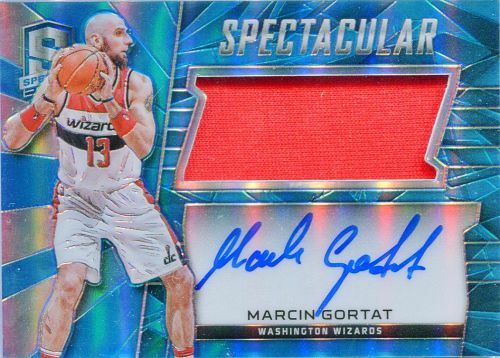 Like most premium releases, 2015-16 Panini Spectra Basketball is headlined by signed cards. 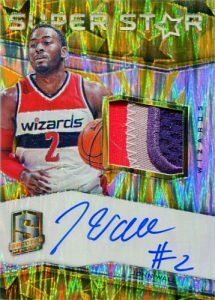 However, Spectra takes things up a notch by including a jersey piece with every autograph. 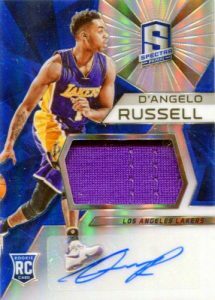 Choices include Superstar Materials Autographs, Rookie Jerseys Autographs and Spectacular Swatch Signatures. 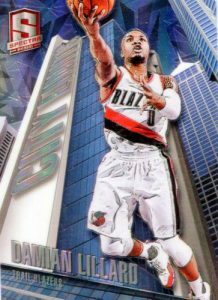 Each of these signed inserts feature a print run of 149 or less, with Prizm parallels going as low as one-of-one. 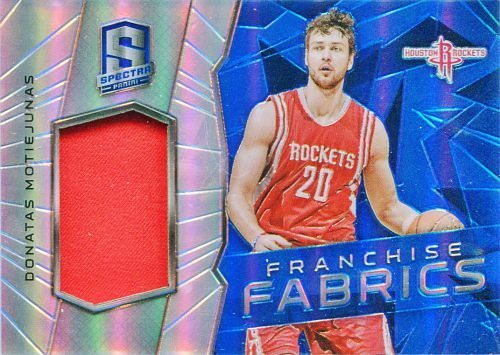 While standard autographs are out, collectors can still get their fix of memorabilia cards. 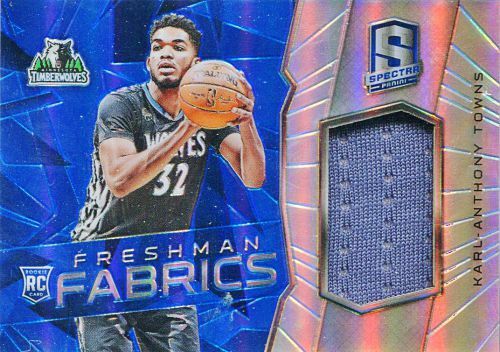 Among these are Materials Prizms (#/40 or less) that cover veteran players and Rookie Jumbo Jerseys (#/49 or less) that offer large swatches for top first-year players. 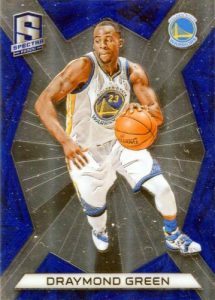 Although hits are the main focus, 2015-16 Panini Spectra Basketball also includes standard inserts. City Limits inserts are a case hit that utilizes a skyscraper design. 100 cards. Serial Numbered #/125. PARALLEL CARDS: Red Die-Cut Variations Prizms #/25, Gold Prizms #/10, Black Prizms 1/1. PARALLEL CARDS: Orange Prizms #/25, Gold Prizms #/10, Black Prizms 1/1. 65 cards. Serial Numbered #/49. PARALLEL CARDS: Gold Prizms #/10, Green Prizms #/5, Black Prizms 1/1. 34 cards. Serial Numbered #/35. 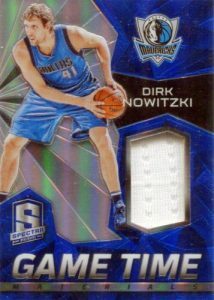 PARALLEL CARDS: Gold Prizms #/10, Green Prizms #/5, Black Prizms 1/1/. *Card #33 only found in parallels. Card #2 not found in parallels. 50 cards. Serial Numbered #/49. PARALLEL CARDS: Gold Prizms #/10, Black Prizms 1/1. *Card #7 only found in parallels. View specific options with the full spreadsheet. 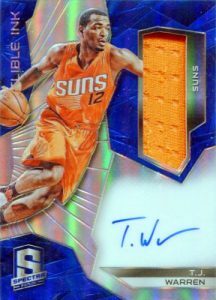 PARALLEL CARDS: Light Blue Prizms #/49, Orange Prizms #/25, Gold Prizms #/10, Black Prizms 1/1. 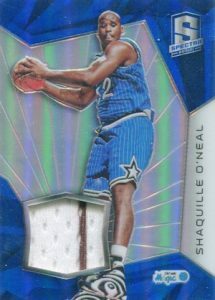 *Card #41 only found in parallels. All subjects not found in parallels. View specific options with the full spreadsheet. 20 cards. Serial Numbered #/30. PARALLEL CARDS: Gold #/10, Black 1/1. *Card #10 not found in parallels. PARALLEL CARDS: Gold Prizms #/10, Green Prizms #/5, Black 1/1. *Card #54 not found in Gold Prizms parallel. For the price, stickers are unacceptable.